Blogging is an essential part of online marketing. It helps your practice gain exposure to a wider audience and develops leadership in your healthcare sector. It may impact your practice results through an increase in online searches and referrals as well as generating interest in prospective new patients. But firstly, what is a blog and why do I need it in my practice? Look at a blog as AN ANNOUNCEMENT from you or your practice. But instead of putting up a poster in your waiting room or speaking in front of an assembly of patients, you write it down and publish it on the internet. Of course, your announcement can now be seen by many more people and even better, these people can share your announcement with others. So blogging helps you in respect to SEARCH ENGINE OPTIMISATION (SEO). The more blog posts you publish on your website, the more indexed pages you create for search engines to find and display in their results. In other words, blogging helps you rank in search engines and get found when people search for specific services or healthcare information. The blog enables you to attract people searching online and familiarise them with your practice. Writing regular blog posts can also introduce you as A THOUGHT LEADER. So if you have some healthcare specific information to share, a blog will help you earn people’s trust and make them remember you and your practice. Furthermore, you can use a blog to place CALLS-TO-ACTION in order to attract new patients. At this stage, you are trying to retain your blog readers and engage them further with your website and your content. So you might ask them at schedule a free assessment or make an appointment at your clinic. It can be time consuming that is why I will mention a few easy ways of finding the right content for your blog. I recommend that you start by answering some of the most popular patient questions and reviewing latest healthcare research. Make sure you are adding some type of value for your reader. You need to optimise your writing to grab people’s attention and rank well in search engines. The more visitors you can attract to your blog and website, the more chances for converting these visitors into new patients. Use compelling images or add a video to suit the content. Use eye-catching and straight forward titles. Break up the text in chunks to make it easy to scan over it. Add calls-to-action, e.g. “visit the clinic for a free health assessment”. Use metaphors and descriptive language where appropriate. Be entertaining as well as clear and direct. So how often should you blog? You might blog once a week or twice a month, and that will be ok if your posts reveal content that engages your online audience. But make sure you publish posts around the same time so that you create anticipation in your readers. And don’t forget to promote your blog on your website, Facebook, on email signature as well as within your clinic. Do your patients know that you frequently write for them? Focus on strong topic related keywords without mentioning your practice name all the time. Ask your patients what THEY want because these are the people you are writing for and these are the questions of the new patients you want to attract. 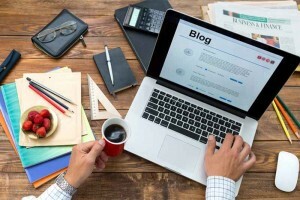 Connect the blog to your website; draft your blog post in an editor such as Microsoft Word or Notepad and then upload it to your website blog module. And add a link to Facebook, too! As you embark on your blogging journey, prepare for the work load tied to finding the best content. Build a calendar and start adding to it some resources that you already have lying around, such as journals and product brochures. I also recommend that you involve a few more people in the content creation process.